Indulge yourself at The Nest Dining in the Sky; an alfresco restaurant perched at the 31st floor of Vivere Hotel & Resorts new dishes on the menu. Savor with The Nest Dining in the Sky’s “Pepper-crusted Pork Belly,” a common dish done uncommonly well. Smothered in rock salt, black pepper and herbs then roasted low and slow, topped with crispy pork crackling. Served with pickle relish in sweet and spicy vinegar paired with steamed rice or baked potato for Php585.00. Best matched with Ice cold beer! 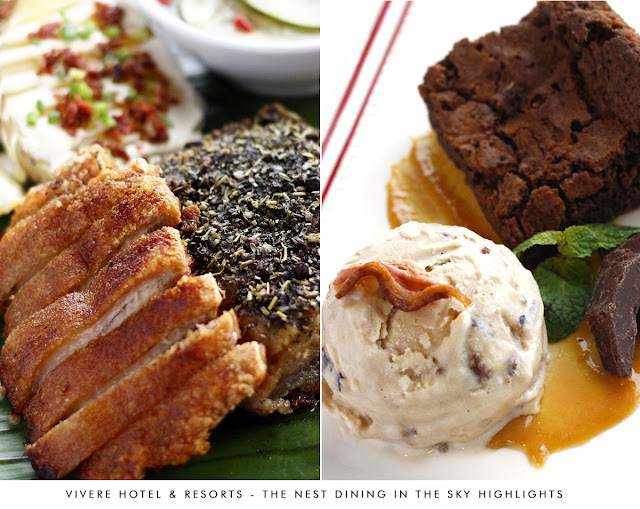 Relish a fresh twist on desserts with “Salted Caramel Brownie with Bacon Ice Cream,” a harmonious blend of fudge brownies layered with salted caramel sauce and homemade bacon ice cream. A dessert for all ages and will astonish even the most die-hard chocolate and bacon lovers for Php300.